The State of Wyoming famous for Yellowstone National Park is home to some of the finest dude ranches in the world. Well worth including in your travel plans Wyoming dude ranches invite you to experience snow capped mountains and glaciers overlooking a landscape where the deer and the antelope still play. Wyoming guest ranches offer a variety of lodging, camping, hunting, white water rafting and fishing facilities. Perfect for any family vacation or group retreat. 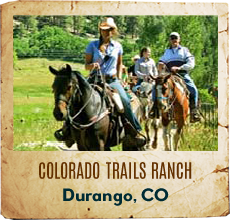 Whether you�re looking for a honeymoon retreat or adventure vacation Wyoming dude ranches have it all. THE RANCH - The Gros Ventre River Ranch is located 18 miles from the western town of Jackson, Wyoming, 12 miles from the entrance to Grand Teton National Park and 45 miles from the entrance to Yellowstone National Park. ACTIVITIES - Enjoy horseback riding, fly fishing, mountain hiking, mountain biking, wildlife viewing, campfire sing-a-longs, or day trips to nearby Jackson, Grand Teton National Park and Yellowstone National Park. RESERVATIONS - We accept week-long stays during our Peak Season (mid-June to mid-September) and three night minimum stays during our shoulder seasons. Crossed Sabres Ranch is a family run operation that offers the vacation of a lifetime for you, your family, or group. 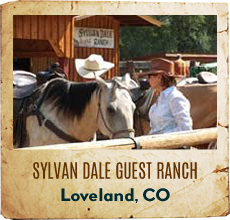 Guests of the ranch will experience horseback rides, fly fishing, hiking, rafting, a rodeo, and more. Located a short 8 miles from the East Entrance to Yellowstone, we are the closest ranch to the park. Abundant opportunities to explore exist just steps from your cabin door. Red Rock Ranch, a premier family owned summer Guest Ranch located in the Bridger Teton National Forest just outside of scenic Jackson, WY, and minutes from Teton National Park. 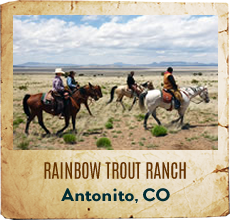 A truly engaging kids program - centered around the horse, riding, guided hiking, fly fishing, trap shooting, fine dining and many more activities all add to the Authentic Western Ranch experience. 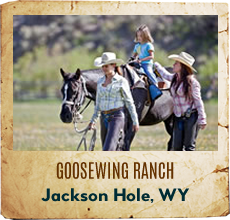 Goosewing Ranch, a working ranch reborn as an isolated retreat deep in the Gros Ventre River Valley, where we combine the lifestyle of ranching in the Wyoming wilderness with many of the modern refinements that make your visit with us especially enjoyable. We invite you to come share this corner of North America's wildest country just as it has been for over a hundred years. Located in Ten Sleep, a quiet corner of Wyoming, the Red Reflet Ranch is a working horse and cattle ranch that utilizes over 24,000 acres of land. With its spectacular landscape, Red Reflet Ranch is full of contrast. From cacti desert to multicolored rock layers in the foothills of the Big Horn Mountains, the landscape if full of surprises that are sure to delight you. 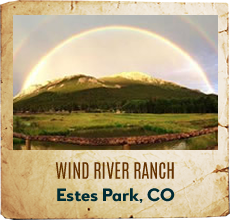 Located within the Rocky Mountains and situated next to the Encampment River, Water Valley Ranch offers a truly unforgettable experience for every individual. Our all inclusive ranch is the perfect venue to host corporate retreats, enjoy family reunions, celebrate weddings and/or unwind for a weekend. We offer fresh meals cooked daily by our on site chef, a conference space equipped with everything you need, various sleeping accommodations, and a plethora of indoor and outdoor activities including horseback riding, kayaking, fly fishing, hiking and much more! Lost Creek Ranch and Spa is a privately owned Wyoming Guest Ranch located at the base of Wyoming's Teton Ranch, North of Jackson Hole, WY and nestled between Grand Teton National Park, Bridger-Teton National Forest, and South of Yellowstone National Park. The Ranch combines outdoor adventures for the entire family and the comforts of a world-class resort in the regions most spectacular location. Enjoy a week-long, all-inclusive stay at one of Wyoming's most magnificent guest ranches nestled at the foot of the red clay cliffs of three mountain ranges. The ranch has kept the authentic western flavor of its origins as a sheep and cattle ranch settled by Scottish homesteaders in the 1890s. 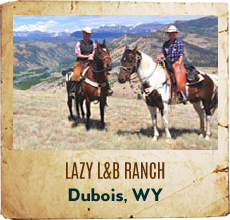 The Lazy L&B is known for its horseback-riding program. Whether you're a beginner or an accomplished equestrian, you'll ride through some of the most diverse terrain imaginable: sandy canyons, high plateaus, grassy rangeland, mountain meadows, piney forests, and alpine country. Diamond 7 Bar is a family owned working guest ranch located in the Black Hills of Wyoming. Our passion lies in cattle ranching and sharing our way of life with families and individuals from all over the world. Please join us on an authentic western adventure that'll keep you coming back for years. 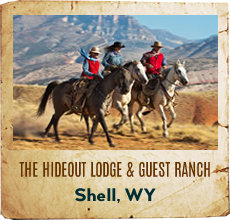 The Hideout is a first-class guest ranch facility. Founded in 1906, the ranch is located in north central Wyoming in the heart of beautiful Shell Valley near Greybull, Wyoming. The range extends from near Cody, Wyoming to the top of the western slope of the Bighorn Mountains. The hospitality and friendliness of The Hideout has attracted guests for more than fifty years. 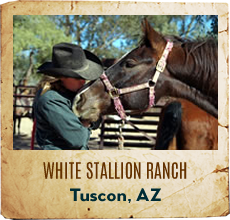 The CM Ranch is a real ranch with a background of many year of experience. It is of particular appeal to parents seeking a wholesome outdoor experience for their children. The area features an exceptional variety of country for riding and pack trips. There is splendid trout fishing both on the ranch and nearby blue ribbon streams. Operated by a native of Wyoming. 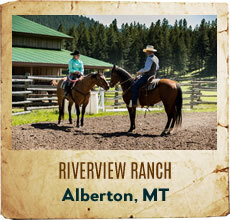 You can enjoy some of the best and most diverse horseback riding in North America at the Bitterroot Ranch in Wyoming. Located in a remote valley bordering the Shoshone National Forest, 50 miles of unspoiled wilderness separate us from Yellowstone Park. The varied terrain includes sagebrush plains, grassy meadows and rocky gorges which give way to pine forested mountains and alpine meadows. Perpetually snow-capped mountains are always in view. 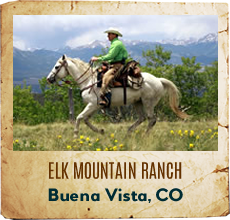 As our guest, you will experience this spectacular, wild country in the best possible way, riding a willing horse. We have a broad range of horses for all skill and confidence levels and you will ride in small groups with people of similar riding ability. The Bitterroot is a perfect choice for those who wish to improve their horseback riding skills because we have certified riding instructors available to give lessons at the ranch. We also offer riding clinics with top clinicians throughout the summer. Few dude ranches share our philosophies and passion for riding and if you desire the horseback riding vacation of a lifetime, the Bitterroot is the perfect match. Guests from around the world enjoy one to three-week holidays on our rustic horse and cattle ranch. The emphasis is on horsemanship - long and short ride trails, wrangle horses from pasture, round up cows to practice team penning, barrel racing, stay overnight at cow camp! No experience is necessary, just with a passion for horses and a sense of adventure. Individual & gap year travelers welcome! Full service guest ranch located 16 miles south of Jackson Wyoming. Horseback riding, river rafting, fishing, pack trips, cookouts. Located close to Grand Teton National Park. Eatons' Ranch is a 7,000 dude and cattle ranch located at the foot of the Bighorn Mountains. For 125 years, we have offered our guests a western experience and shared with them a way of life. We are proud to carry on a tradition and preserve a ranching heritage that goes back five generations. Nestled in the shadows of the beautiful Snowy Range Mountains is a place where the peaceful romance of the Old West has never ended. History comes alive at the Vee Bar Ranch in the original ranch buildings and antique furnishings that fill the lodge and guest cabins. Take horseback rides, hike, fish, tube the river, enjoy evening entertainment, and count the stars from the outdoor hot tub. Tucked into a secluded valley in the Big Horn National Forest of north central Wyoming, Paradise Ranch hosts families, couples and individuals looking for a unique blend of relaxation and excitement in the mountain West. The ranch is nestled along the edge of a forest of Lodgepole Pine and Quaking Aspen and surrounded by over a million acres of national forest lands. Moose Head offers a spectacular Teton vista, small trail rides for all abilities, abundant wildlife sighting opportunities, gourmet food and well appointed modern log cabins near streams and ponds. The ranch is a private enclave completely surrounded by Grand Teton National Park. Trout ponds for fly fishing, equipment & instruction available. 32 miles from Yellowstone and 26 miles from Jackson.